Plans to create a new £2m visitor centre criticised for resembling a toilet block have been given the green light. 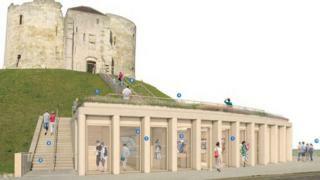 English Heritage want to build the centre adjacent to 13th Century Clifford's Tower in York. The organisation said the project would enhance access to the site and work would begin in November. One councillor described the plans as "an act of vandalism" but the majority voted in favour of the proposals. Objectors claimed building the centre into the base of the tower's mound would destroy the view and have a detrimental effect on the appearance of the area. Ward councillor Johnny Hayes had urged the planning committee to reject the plans. "It reminds me of a toilet block but it is not the building at issue, it is the position at the base of the mound that people are objecting to," he said. Council officers said the proposed work, which includes new viewing platforms within the tower itself, would have the potential to "greatly enhance" the visitor experience. Councillor John Galvin said: "Historically it is an iconic building but there is nothing there to tell you about it. "People demand and expect to have decent interpretation of historic buildings." Dr Jeremy Ashbee, head properties curator at English Heritage, said: "An enormous amount of care was taken in preparing the planning application, in consultation with planners, designers and members of the public. "We are thrilled to have permission to go-ahead with this project."